Hey there, everyone! I hope that you are having a good morning so far. Do you want to know what was so awesome about this past Saturday? We stayed home, and watched college football (& tennis) all day long. It was SO nice to be home, and just hanging out together all day. I ran to the store for a brief moment in the morning to get some things we wanted to eat...but other than that, it was an awesome day at home. If you have been a long time follower of my blog, you know that most Saturdays used to be spent out of town going to football games for my brother, Casey. Well, he made the decision to leave Carroll College this year because it just wasn't the right fit for him. He will be taking a year off, but plans to start back next fall at UofM, and hoping to try and walk on to the football team here. :) I can't even tell you how excited I am for that!! I have a card to share with you for Stamper's Dream today. It is also my card for CPS sketch #235, where we were sponsored by Want2Scrap this week. I also created this card for The Pink Elephant challenge #116- vintage theme, and for the Ribbon Carousel challenge #20- get punny. Here is what I created! Instructions: Make card from orange cardstock. Cut banner paper slightly smaller, round the corners, sand the edges and adhere to the middle. Cut a doily in half, cover in distress ink using a blending tool, and adhere to each side of the banner paper. 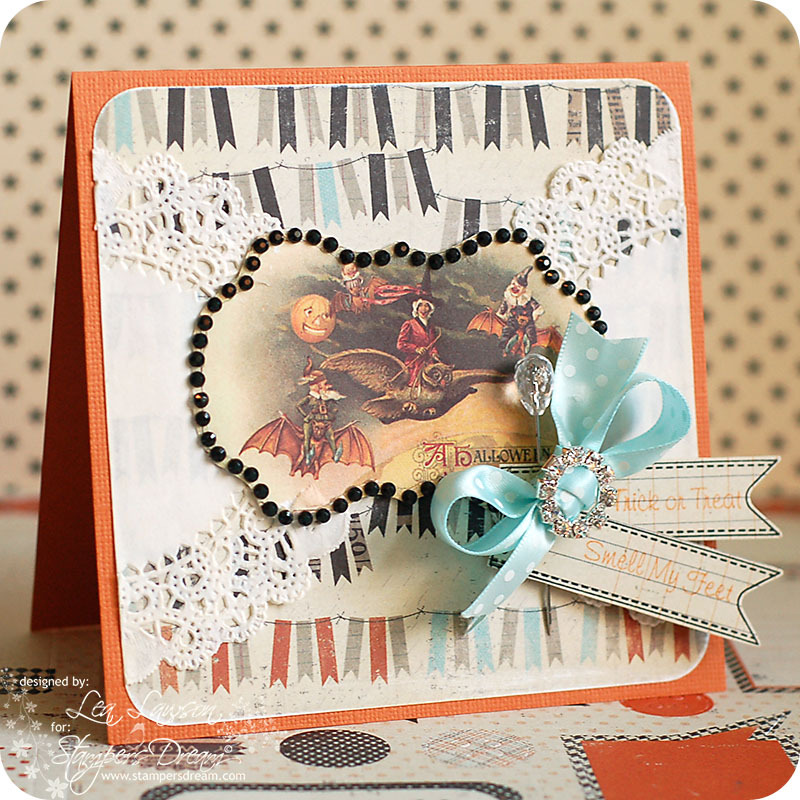 Adhere the jeweled frame to a Halloween vintage image, cut off the excess and adhere to the middle of the card. Stamp two banners to patterned paper, and then stamp the sentiment to the middle of each one. Cut each banner out, and adhere together as shown to the lower right side of the vintage image. Adhere a clear topped pin to the left side of the sentiment banners. Tie a bow from light blue ribbon through the circle jeweled charm. Adhere the finished bow to the left side of the sentiment banners to finish. I really LOVE this new Halloween paper collection from My Mind's Eye. My favorite part is that the light blue is carried through a lot of the papers, but it just pops in here and there. I think it is a brilliant color combo!! I also wanted to share with you a little peek at my card set going up on the Key Ingredients blog today! To see the full set, please CLICK HERE and check it out!! The September Key Ingredients kit is an awesome one...I just LOVE the papers!! If you aren't a Key Ingredients subscriber, you should definitely check it out! It is a fun piece of mail to get every month! Very nice card, love the vintage look! Thanks for joining us this week at The Pink Elephant, hope to see more of your creations soon. hugs, Frances. Love all the vintage-y goodness :) Thanks for joining us at The Pink Elephant! You're a Top Spool this week! Be sure to stop by the RCC blog to pick up your badge!